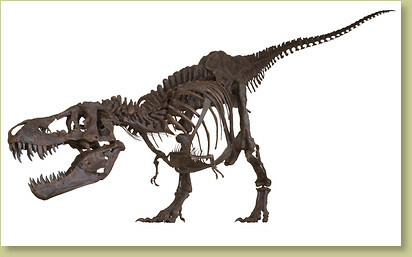 STAN is the largest, most complete, Tyrannosaurus rex, of the male (or gracile) morphotype, ever found. Discovered in what had once been the sandy bank of an ancient stream, the bones of the skeleton and skull were separated and spread over a wide area. Spring floods eventually covered the bones with mud where they remained buried for more than 65 million years. This disarticulation resulted in near perfect preservation of the skull. Stan Sacrison discovered this magnificent specimen in the spring of 1987. 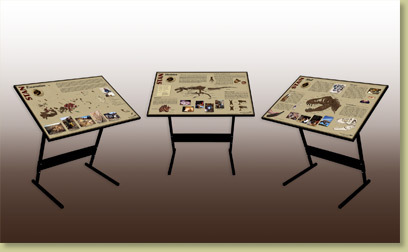 In the spring of 1992 the Black Hills Institute staff undertook the excavation. It took more than 30,000 hours to prepare STAN for display. STAN T. rex is truly the best T. rex replica available anywhere! Nearly 40 feet (12.2 m) long and 12 feet (3.7 m) high at the hips. The strong, steel support structure is hidden within the bones, allowing the eye to follow the 'in-motion' appearance of this impressive, crowd-pleasing fossil skeleton replica. Each STAN T. rex skeleton is constructed according to your needs, allowing you to fashion a more dynamic exhibit. Whether you want your STAN walking, stalking, attacking, running, jumping or looking your visitors right in the eye, we welcome your input, so long as the pose requested is natural and anatomically possible. Constructed modularly with no section more than 6 feet long, this incredible specimen can be assembled by an experienced crew of six in just under an hour! Go to STAN's Interesting Info page for more in depth info and pictures.